★6th & 7th Nts Free★ Beachfront/Great Snorkeling in Backyard/Walk to Beach Bars. ★Beachfront★ Need add'l space? See listing 7555890 for the 5-bdrm Bottom Unit. NOTE: every photo - interior and exterior - that you see here was taken in 2019. Beachfront, calm waters out back, high ceilings, loads of natural light, and walking distance to Rincon's top restaurants! Local favorite beach bar, Villa Cofresi, is a mere 2-3 minute walk down the sand. 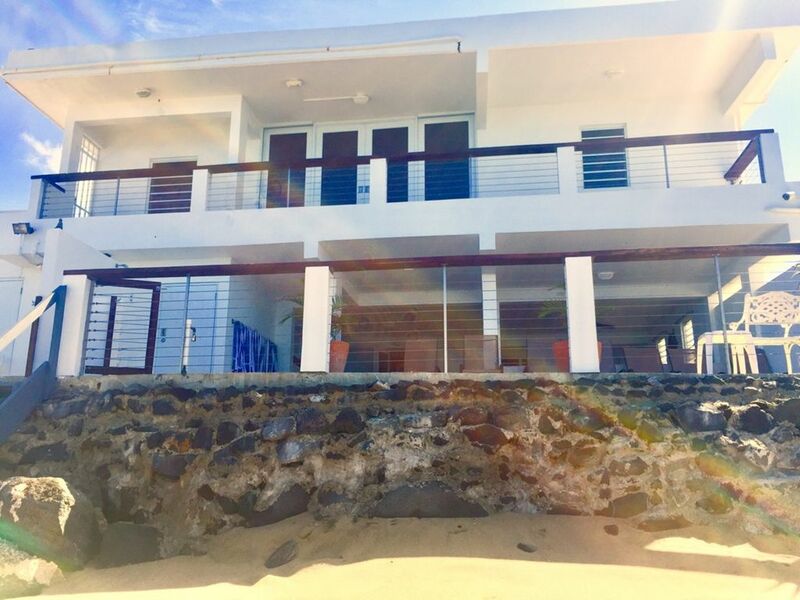 Set several blocks off the main road and facing west, enjoy complete tranquility, light winds at your back, and the absolute best sunsets in all of Puerto Rico! Air-conditioned bedrooms, big kitchen, oversized living room with 60" cable TV, free WiFi, free-use laundry facility, and abundant street parking available. Sitting a mere 20 feet from the waters edge, the sensation from inside the unit is almost like being on a boat ... but with all the luxuries of land! The kitchen, dining, and living spaces are presented in an open, airy, ocean-facing floorplan. The entirety of the unit features 9 foot ceilings. Split-system air conditioning units in the four bedrooms (only) ensure great nights of sleep after days spent frolicking on the beach that is your backyard. Note that this listing is for the Top Unit. There's also a 5-bedroom Bottom Unit rental (see listing 7555890). The beach stairs is the only feature shared between the units. Each unit has its own private outdoor space. Free-use, shared with Bottom Unit. Abundant street parking available immediately outside the property. Perfect location and excellent staff. The property was everything we needed for our trip, and we will definitely be back!